The Cuisinart Bread Maker is for those who love the smell of fresh bread. Once all the ingredients are fed, this programmable automatic breadmaker mixes it, kneads it, and bakes it to perfection with absolutely no risk. It comes with a variety of menu options like 1, 1.5, and 2-pound loaf sizes, and three crust settings - light, medium, or dark. The bread maker has a power failure backup system which stores the bread making process in memory and resumes when power is restored. All the parts and accessories are dish washer safe and very easy to clean. 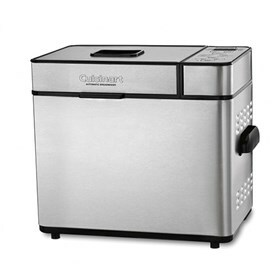 The Cuisinart 2 Lb Bread Maker Nic has many exciting features for users of all types. You can extend the lifetime of your Cuisinart 2 Lb Bread Maker Nic with the purchase of a FactoryOutletStore Factory Protection Plan. See the Cuisinart 2 Lb Bread Maker Nic gallery images above for more product views. The Cuisinart 2 Lb Bread Maker Nic is sold as a Brand New Unopened Item.